Florence Aleta was born on October 18, 1906, at Downs Station near Silverton, the third daughter of Benjamin and Franie Neuenschwander Heyerly. She was named for Florence Downs, who suggested the name to Franie. Florence's older sisters were Inez and Elma. Two years later the family was complete with the arrival of brother Vernon. They moved to a farm they bought west of Molalla near where the Neuenschwanders lived. Land had to be cleared and Inez told of her mother digging around large oak trees until Inez would yell, "Mama, Mama, the tree is falling," and they would run out of the way. Florence's ethic of anything's possible no doubt came from her mother's determination. Florence walked with her sisters and other neighborhood children to Rural Dell School, and later walked the other direction to Molalla High School. In 1925 she was in the last class to graduate from the old school. She often spoke about her mother and how she was always available to go out and help anyone in the neighborhood who needed her. When the Willamette Valley Southern railroad was being built on the back of their farm, workers boarded at their home. In 1918 when the flu epidemic spread to Oregon, her uncle and aunt, Ferdinand and Sarah Heyerly Mantie died. Two of their three children, Albert and Ernest, came to live with her family. Florence commented that she could not imagine how her mother could have had so many living there. On March 1, 1927, Florence married George Harry Gottwald, brother of Inez's husband, John, in a double wedding with her sister Elma and Lewis Veelle in Oregon City. The minister was R. G. Meserli. Florence had, no doubt, known George most of her life, since they had been in grade school together. George was the youngest child of the Gottwald family, and he was batching with his father when he brought home his new bride. Grandpa did not want anything changed around the house and farm, but Florence had her own ideas about what should be done. She just pretended she did not understand when he complained to George in German or commented to others, "That's Florence's doing!" Undaunted, she persevered. It must have been a sad time in 1939 when after so many years of waiting, her flrst baby girl did not survive. But the tears turned to joy in 1941 when Elaine Georgia was born. The carefully filled in baby book and all the pictures attest to a loving mother and father. She did not anger easily, but when Grandpa gave Elaine a puff on his pipe of homegrown tobacco, the neighbors probably heard Florence's response. During the depression years, times were not easy. Florence told about saving for years to make purchases. The family never borrowed any money and were very careful in the way they lived. They expanded their farm by buying twenty acres, and George often worked for others in the neighborhood. When there was work to be done like digging potatoes or bringing in the hay, Florence would be out there helping. Since they lived on the home place, relatives were always visiting, and nieces and nephews would come and stay during the summer. Neighbors knew each other well and visited back and forth, especially on Sunday. George died in a farm accident in 1956, and Florence continued to live on the farm the remainder of her life. Through the years, Florence kept busy with her flowers and vegetable garden. She was a member of Smyrna United Church of Christ where she served as treasurer. Her work with the Women's Fellowship of the church included quilting, crocheting, knitting, helping to serve the luncheon and serving in various offices. She might have been a charter member of the Rural Dell Women's Club (Extension); she received a 50 year member commemoration some years ago. Her interest in community affairs led to her writing local news colunms for the Canby Herald and the Molalla Pioneer for several years. One year she worked as a farm census-taker for the U S Department of Agriculture. She could be found every summer out in the berry fields picking boysens and evergreens. She spoke about picking hops in the early years and how much she enjoyed the company of the other pickers. 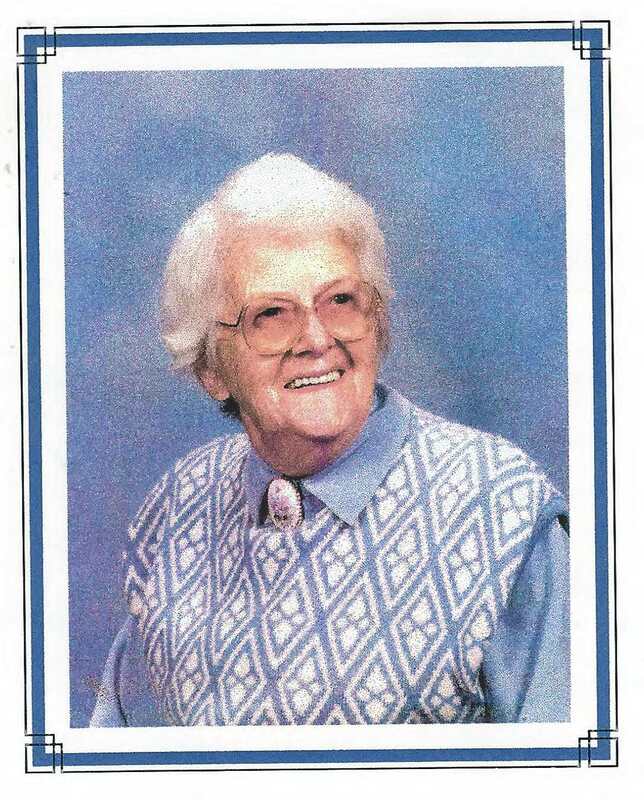 Florence led 4-H clubs for a number of years: knitting, sewing, cooking, were among them. Her knitting club was unusual as it contained several neighborhood boys. Elaine married Joel Daniels, a lifelong neighbor, in 1963, and after several years they had a house built on a part of Florence's place. Their two boys, Marcus Gottwald and Philip Albert, were a great joy to her and she was the chief babysitter. She avidly followed all their activities through their school years, attending all the games, celebrating the milestones and delighting in Philip's marriage to Barbara Beyer. She loved watching her two great-grandchildren, Helen and Andrew, play as she soothed them and laughed at their antics. Her family is thankful that Florence was able to remain in her home until her death. She was seldom ill, rarely took any medicine and remained agile. She was a model for us all. She recently celebrated her ninety-third birthday. Florence died November 7, 1999.